This article is about Mario & Sonic at the London 2012 Olympic Games for the Wii. 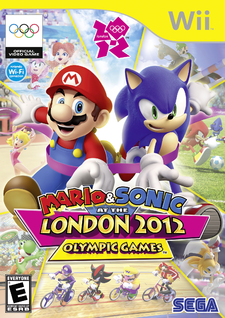 For the Nintendo 3DS version of the game, see Mario & Sonic at the London 2012 Olympic Games (Nintendo 3DS). Mode(s) Single Player, Multiplayer, London Party, Wi-Fi, Bonus Mode, Records. Mario & Sonic at the London 2012 Olympic Games is a sports title for the Wii with a Nintendo 3DS version of the game released as well. Both games make up the third installment of the Mario & Sonic series. New sports, such as soccer (association football) and Equestrian, along with other athletic events, debut in the Wii version. The game takes place in London, home of the 2012 Summer Olympics. 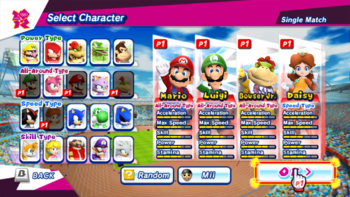 The Wii version of the game features 21 total playable characters. These characters are identical to those featured in the Wii version of Mario & Sonic at the Olympic Winter Games. Like Mario & Sonic at the Olympic Winter Games, Dream Events take place on areas from Mario and Sonic games. Ten appear in the game. Also, some locations have had a rename, but its music is kept the same. For example, the Sky Station Galaxy is referred to as the Synchro Battle Galaxy. Some Items are used in Dream Events and London Party. Buying goodies returns in the game. Costumes make a reappearance in this game. Some of them return from the past installment. Additionally, there are costumes of the playable characters. Mario Win through a Scratch Card or Pay 10 blank cards. Luigi Win through a Scratch Card or Pay 10 blank cards. Princess Peach Win through a Scratch Card or Pay 10 blank cards. Princess Daisy Win through a Scratch Card or Pay 10 blank cards. Bowser Win through a Scratch Card or Pay 10 blank cards. Bowser Jr. Win through a Scratch Card or Pay 10 blank cards. Wario Win through a Scratch Card or Pay 10 blank cards. Waluigi Win through a Scratch Card or Pay 10 blank cards. Yoshi Win through a Scratch Card or Pay 10 blank cards. Birdo Win through a Scratch Card or Pay 10 blank cards. Donkey Kong Win through a Scratch Card or Pay 10 blank cards. Diddy Kong Play against a friend 20 times in Single Event Mode. Dry Bowser Win through a Scratch Card or Pay 10 blank cards. Dry Bones Win through a Scratch Card or Pay 10 blank cards. Fire Mario Win through a Scratch Card or Pay 10 blank cards. Bee Mario Win through a Scratch Card or Pay 10 blank cards. Propeller Mario Win through a Scratch Card or Pay 10 blank cards. Penguin Mario Win through a Scratch Card or Pay 10 blank cards. Toad Play against a friend 5 times in Single Event Mode. Larry Koopa Answer 10 questions correctly in the London Party Quiz. Morton Koopa Jr. Play as a Mii 100 times in Single Event Mode. Wendy O. Koopa Play as a Mii 10 times in Single Event Mode. Iggy Koopa Play as a Mii 50 times in Single Event Mode. Roy Koopa Answer 50 questions correctly in the London Party Quiz. Lemmy Koopa Answer 100 questions correctly in the London Party Quiz. Ludwig von Koopa Play against a friend 10 times in Single Event Mode. Sonic the Hedgehog Win through a Scratch Card or Pay 10 blank cards. Miles "Tails" Prower Win through a Scratch Card or Pay 10 blank cards. Knuckles the Echidna Win through a Scratch Card or Pay 10 blank cards. Amy Rose Win through a Scratch Card or Pay 10 blank cards. Dr. Eggman Win through a Scratch Card or Pay 10 blank cards. Shadow the Hedgehog Win through a Scratch Card or Pay 10 blank cards. Silver the Hedgehog Win through a Scratch Card or Pay 10 blank cards. Metal Sonic Win through a Scratch Card or Pay 10 blank cards. Blaze the Cat Win through a Scratch Card or Pay 10 blank cards. Vector the Crocodile Win through a Scratch Card or Pay 10 blank cards. Rouge the Bat Win through a Scratch Card or Pay 10 blank cards. E-123 Omega Win through a Scratch Card or Pay 10 blank cards. Charmy Bee Play for a total of one hour in Single Event Mode. Espio the Chameleon Place first 10 times in Single Event Mode. Big the Cat Play for a total of three hours in Single Event Mode. Super Sonic Place first place 50 times in Single Event Mode. Cream the Rabbit Place first 10 times in the London Party Bonus Games. Jet the Hawk Win through a Scratch Card or Pay 10 blank cards. Wave the Swallow Win through a Scratch Card or Pay 10 blank cards. Storm the Albatross Win through a Scratch Card or Pay 10 blank cards. Tikal the Echidna Place first 100 times in the London Party Bonus Games. Marine the Raccoon Place first 50 times in the London Party Bonus Games. Emerl Win through a Scratch Card or Pay 10 blank cards. Werehog Place first 25 times in Single Event Mode. Chip Play for a total of five hours in Single Event Mode. Egg Pawn Win through a Scratch Card or Pay 10 blank cards. Wenlock Pay 10 blank cards. Most music is taken from the past installments. All rival music except for Dino Piranha, Birdo, Rouge, and Gooper Blooper, for Dino Piranha and Gooper Blooper have their music boss theme from their past games. Birdo's and Rouge's are original. Main Theme from Super Mario Bros.
Mario Circuit from Mario Kart: Double Dash!! Note: Players can also win collectables from either Scratchcards or Blank Exchange. Stickers are the main point in London Party Mode. The first one to get either 16 (about 30. min. ), 32 (about 60 min.) or 48 (about 90 min.) stickers win. Players can collect stickers either by winning bonus games and events from characters or rivals, or by obtaining them from bonus balloons. Wii Jason Venter, GameSpot 7/10 "Mario & Sonic at the London 2012 Olympic Games takes no real risks and perhaps relies too heavily on your fondness for its leading mascots, but it still manages to provide a wide variety of minigames and bonus content that should keep you busy for a long while (especially if you have a few friends handy). Mario and Sonic are both capable of providing experiences that are more memorable than these, but they also make good enough athletes to produce a worthwhile party in London.'" Wii Johnny Minkley, Eurogamer 6/10 "In short, Mario & Sonic's London outing is much like their Beijing sojourn of late 2007. It'll keep younger children in particular amused and entertained over Christmas, and it's a safe bet for festive family fun if you have enough controllers to go around. But, rather like the console it's made for, it's getting on a bit. And while Zelda defies old age with every vigorous thrust of Link's MotionPlus-enabled sword, Mario & Sonic's best years are behind it." Wii James Newton, Nintendo Life 5/10 "What felt fresh and enjoyable four years ago doesn't cut the mustard in 2011, particularly when some elements have been stripped out or reworked to poor effect. London Party mode is a poor alternative to the dozens of superior Wii party games, and while its cast of gaming greats is enough to forgive some of its mistakes it's still pretty far off the mark." Mario Party series - Many minigames from the London Party Mode resemble minigames from many past installments, and London Party resembles Mario Party games in general. Mario Kart series - Moo Moo Meadows from Mario Kart Wii appears as the stage for Dream Equestrian. The countdown sound effect at the start of a race is also used in London Party, and if there are three seconds left until the end of the Dream Events. Also in Dream Fencing, players can come back as a bomb balloon similar to a Mini Bomb Kart in Mario Kart 64. Yoshi's Story - Rail Lift appears in a Dream Event. Super Mario Sunshine - Gooper Blooper is the last obstacle for Dream Rafting. A remix of the boss music is also played here. Super Mario Galaxy - Sounds from this game are used in Dream Space Walk. Planets from the Good Egg and Gateway appear in the Dream Spacewalk event. Dino Piranha is a rival. His boss theme is used. There is also the bee suit. Also used in Dream Space Walk, a track called "Into the Sea of Stars". The Battlerock Galaxy is also used as a Dream Event location. Also, Mario's spin move is used as his super dash, as well as an attack in the Dream Space Walk event. New Super Mario Bros. Wii - Sounds from the game are used in Dream Rafting. World 4 is the location for the event. The Super Star music from this game is used in Dream Hurdles. There are Koopaling, Penguin and Propeller suits that the players can use. Super Mario Galaxy 2 - Dream Space Walk takes place at the Sky Station Galaxy (named the "Synchro Battle Galaxy" in this game). Various planets from this galaxy are also seen. Mario Sports Mix - Dream Fencing greatly resembles Smash Skate. Mario & Sonic at the Olympic Winter Games - All the Mario series and Sonic series songs return as well as the rival themes. Also, the Miis have the same animations as this game. In the Wii version, the voices of the Mario characters and the announcer were ripped from this game, while a few others are new. The Sonic characters have a few similar voice clips as this game, but they were revoiced. Super Mario Bros. 2 and Super Smash Bros. Brawl - Peach's special speed boost animation (in which she floats, leaving a trail of hearts) during running events is nearly identical to her floating animation pose from Brawl. This title's Wii box art uses a different color scheme than the traditional white coloring, using a yellow coloring instead. This page was last edited on April 8, 2019, at 14:53.